PT: As far as I know, you just appeared out of the air one day on Google+, but I’m sure that’s not the whole story. When did you become the Scribbler? How did it happen? AN: I have always enjoyed drawing for friends & family, but have never really shared any of it publicly. In the last 12 months I have been doing a lot more drawing with my daughter, and I started sharing some of this on Google Plus. I received a really positive response to those first drawings, and one or two people asked me if I would do drawings for them. ‘scribblegraph’ still remains the space where I draw whatever is on my mind, but the ‘scribblecrush project’ began as a way to share requested drawings. The idea was simply to pass on anonymous ‘love notes’ to people on request; a fun, light-hearted and positive project. It grew very quickly and became something that people really wanted to be involved in. I have had all kinds of requests for this series, including a series of 25 illustrations that were used as decoration on a couple’s wedding tables, and illustrations for gifts on anniversaries, birthdays, civil unions… it has been incredible! I have truly enjoyed seeing how different people react and value my scribbles. AN: That’s a good question. I have never invested much time in social media of any kind; I’m very much the type of person that believes if friends want to stay in touch, they have my number and can use it! Having said that, I have long been an advocate of Google and the services they provide. I was very excited about the now defunct Google Wave project, and was involved in BETA for that. Google Plus has been the natural progression to that, and it has been an amazing success. I began using it religiously as a way to stay in touch with family & friends, sharing photos with my sister etc. Starting ‘scribblegraph’ there wasn’t really a planned conscious decision; it was very organic. The more people asked to see, the more I shared, and it probably wouldn’t have happened as it has without that encouragement and support. Building a ‘community’ or people on Google+ is something that has taken a fair bit of dedication and persistence, but it has been very rewarding. PT: When you started, your work seemed to be mostly a mix of scribble and photography. Recently, you seem to be focusing more on scribbling. How did this shift come about? AN: The focus shift came with the inception of the scribblecrush project – they were always intended to be quite quick, accessible drawings to send a simple message. 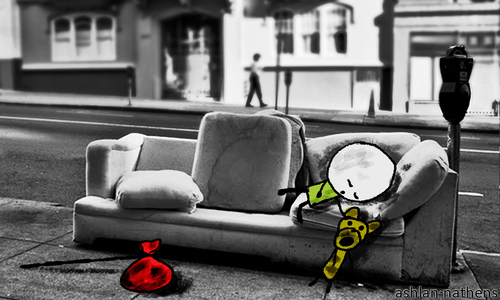 I still very much enjoy mixing photography with illustration, but that is mainly for my own drawings. I do still use photography where I feel it will work with a particular illustration. 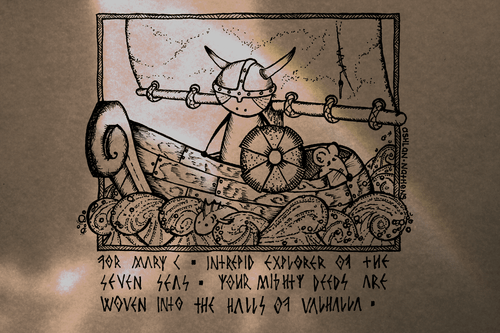 For example, one of the scribblecrush project illustrations (for Mary C) features a viking sailing ship on the high seas. I had a very clear idea of how I wanted the lighting for this to look: as if light were reflecting off water. I achieved this by balancing the drawing above a deep dish of water with a mirror made of shattered glass below it, reflecting direct sunlight. It didn’t work quite as I intended, but it’s subtle enough to be effective. Incidentally, i didn’t have quick access to a photocopier or printer, so I used the original illustration to do this, and very nearly learned a valuable lesson about using master images near water. I won’t be doing that again soon! PT: It seems like everyone who gets this much attention on social media (Austin Kleon, the Bloggess, Hyperbole and a Half, etc.) announces a book at some point. Can we expect a book from you in the near future? AN: Definitely. This is a very firm goal of mine. I have no idea where ‘scribblegraph’ will take me, but if I end up being able to publish a book and have just one person enjoy it, then it will have been a success for me. I have had a number of manuscripts sent to me, and am already working on ideas for one of those. I also have a cousin who is a senior editor for a publishing house here in Australia and, although the world of book publishing has been adversely affected by many things in the last few years, she tells me that there is still hope for the truly determined few. I don’t give up easily. PT: Has your life/work changed appreciably since the Forbes interview? AN: Not enormously, other than a huge sense of satisfaction in knowing that I’m reaching people. I have had two wonderful interviews; Art Info approached me for press release a few weeks after Forbes, and that was a lovely article. Mostly it is a case of continuing to share work, and remain focused on creating new things to share. With any type of creativity, be it photography, music, or “art” of any type, I believe you either give your whole heart to it, or don’t start. That’s a decision I had to make very early on: either I was going to apply myself 110%, or put it aside. There really was no way to do it half-heartedly. What I knew I didn’t want to happen was to wake up in ten years and realist I missed a huge opportunity here. i don’t think there would be anything sadder than to let a passion slip away like that. To learn more about Scribblegraph, Scribblecrush, and view more of Ash Nathen’s work visit scribblecrush.com.au.